The recent introduction of John Deere’s “Wireless Data Transfer” focuses on simplifying the agricultural data-sharing process among producers, as a growing amount of information has been made available thanks to new technology within precision agriculture. Deere’s latest technology enables the wireless sharing of data between the GreenStar 3 2630 display, MyJohnDeere.com, and the producer’s farm management information system. Previously, agricultural producers had to download the data on a memory card or a USB flash drive before transferring the data to a computer in the farm office or at home. Kathy Michael, product manager, John Deere Intelligent Solutions Group, says in the product introduction news release, "More of our customers are collecting data from machinery operating in the field. They analyze the data to improve overall operations and share the data with trusted advisors to help make better decisions. 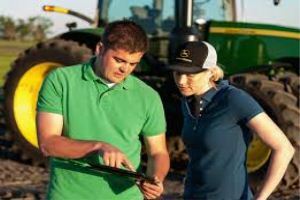 With the introduction of Wireless Data Transfer and data sharing on MyJohnDeere.com, overall data collection, transfer, and management will be much easier." The Wireless Data Transfer allows data to flow wirelessly to the customer’s personalized portal on MyJohnDeere.com, where they can then access the data from smart phones, tablets, computers, or any other internet-enabled device. This information can then be easily shared with trusted advisors and sent directly to the 2630 Displays they are using in the fields. As producers continue to gather valuable data relating to precision agriculture, Deere is introducing new technology to simplify the sharing process, with hopes of returning tangible positive results in the field.